Professional grade rust stain removers designed to dissolve the stain within seconds. Pre-mixed liquid or powder formula available to fit both home owners and the professional's needs. Formulas to prevent stains and scale caused by iron in well water from building up on walls sidewalks fences shrubs and other elements of landscaping. They are concentrates that must be mixed with water in the feed tank of the feeder system. Liquid Fertilizers designed to be administered through the irrigation system by an Irrigation Feeder System or ProFeeder, providing a steady stream of nutrients to the lawn & landscape. Formulas designed to deliver organic bio-nutrients to your landscape or keep away unwanted pests. Injection Feeder Systems consist of a heavy-duty tank and lid with an injection pump and pump-start relay. They can be purchased a la carte or as a complete kit designed for use with a below-ground or submersible well pump. 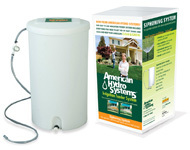 Siphoning Feeder Systems are durable and weatherproof designed to be used with above-ground well pumps. Protect your above-ground pump from rusting out with the Pump Haus! A water driven injection system that automatically feeds fertilizer into the main line based on the water flow. Once installed, simply connect a bottle of formula and watch the ProFeeder go to work!